Bob Marley’s story is one of the 20th century’s most powerful and compelling human dramas. A profound songwriter and a prolific musician, Marley died at age 36 from melanoma cancer. His meteoric rise to international cultural importance and musical significance made him one of the most significant contributors to world culture. An uneducated ghetto poet, Marley was the poet laureate of reggae music, and, according to cultural critic Dr. Basil Wilson, reggae music’s “classical troubadour.” As one-third of the legendary reggae group the Wailers, his words represented the lyric poetry of rebellion. He became the group’s most popular and successful spokesman, though not it’s most militant; that role was filled by Peter Tosh. Marley’s life work was filled with universal and immortal qualities. His music was the embodiment of the revolutionary spirit of human freedom. His visionary music opposed violence, embodied struggle and the celebration of life. It transcended race and class distinctions, geographic boundaries and political and ideological affiliations. Marley made the night’s news and was the front-page story wherever he went around the world. In Ireland, he shared headlines with Pope John Paul II on the Pope’s visit to that country. Voted the “hottest band in music” by Rolling Stone magazine in 1979, the Wailers broke all attendance records set by the Beatles and the Rolling Stones in Europe in 1980. Dr. Joseph Issel, the Caucasian cancer specialist who treated Marley during the period up to his death, described the musician as one of the most dangerous black men on earth, because of his unceasing fight for equal rights and justice for the downtrodden. Issel even publicly questioned why he opted to treat him. Known mostly for his pioneering work in reggae music, musical genius, revolutionary ideals and often-stoic demeanor, Marley had a gentler side. He was sensitive, possessed a boyish charm and had a riotous sense of humor. “In all his glory, a man is just a man. Despite every reason to hate, his songs were a message of love. More importantly, as Hearne said, “Bob Marley dredged so much loving into absolutely original music of his grim, hard, contemptuously treated childhood of poverty and neglect.” Every aspect of Marley’s brief but extraordinary life has been the subject of the pen. 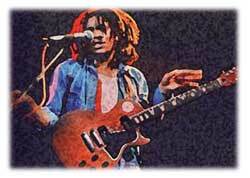 His music intertwined with his Rastafarian ideology expressed cultural authenticity. The themes of his songs were rooted in sociopolitical, spiritual and cultural experiences of the Third World, and his lyrics were filled with passion and emotion. His lyrics and Rastafarian philosophy demanded a discourse between oppressed and oppressor. He also placed the island nation of Jamaica on the world’s cultural map. Marley loved and trusted children unconditionally because he appreciated their purity and innocence. Musicologist and a music director at XFM Satellite Radio, Dermott Hussey recalls, “Marley was at his most vulnerable best and relaxed in the presence of children. He could be himself.” Hussey recounts an illustrative but poignant event at his home in the posh suburbs of Kingston. He had invited Marley to dinner and Dermott’s youngest preteen daughter had a crush on Marley and refused to come into the room with the singer. Sensing her apprehension and nervousness, Marley sent her a ginger log (a candy) to entice her into the room. Hussey recalls how amazed he was at the sight of this revolutionary exhibiting such reassuring calm in the presence of his child. This anecdotal story countered the prevailing culture that disparaged Rastafarians because of their hair and unusual appearance. They were even called “black heart men” in the community and children in particular were taught to fear them. Neville Garrick, Marley’s artistic director, confidant and sometime secretary, remembers with great fondness the occasion when the singer met Crown Prince Wassen, the son of the late Ethiopian leader Haile Selassie, in London. The prince gave Marley a ring from the house of Judah that belonged to Haile Selassie, designated as the spiritual leader by the Rastafarian religion. This moving gesture of honor momentarily brought a smile of joy to Marley’s face. According to Garrick, there was “a tranquil feeling of happiness as a graceful smile emanated from his face.” Marley was never known for public displays of emotion, despite his sense of humor. Although he laughed a lot, he rarely, if ever smiled. In 1979, Marley was the special guest of Prime Minister Robert Mugabe at Zimbabwe’s Independence inauguration ceremony. Garrick recalls attending a soccer match at Zimbabwe’s national stadium and being surprised to see Marley, a fierce soccer player and avid fan, jumping up and down with his hands in the air, gleefully cheering on the winning team. Garrick said he was surprised by this public display of youthful enthusiasm and exuberance by Marley. Marley felt a special sense of pride and joys regarding Zimbabwe’s Independence because he was seeing his dream of African liberation unfold before his eyes. He had dedicated his life to this cause. Like most people, Marley had insecurities that manifested in different ways, according to Garrick, who is more than 6 feet tall. 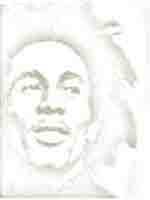 He was much taller than Marley and the singer was acutely conscious of this fact. Marley saw himself as a leader and often questioned his own physical stature. Garrick recalls several friendly discussions or ‘brotherly disagreements’ as he calls them, where they clashed. When things got a little loud, Marley would remark,”Yu ah look pon de skip like yu waan fite.” To which Garrick replied, “If I wanted to fight you, I wouldn’t be here.” At this, both men would break out in laughter. Hussey recalls how once he walked into Marley’s house at 56 Hope Road and greeted him with a slap on his back in front of his entourage. Marley reacted sharply to this perceived insult, however, sensing that a scene would have been inappropriate and given his respect for their friendship, Marley responded with banter. “Mek we beat up this brethren,” Marley said. Everyone responded with laughter. He knew no one would carry out this rhetorical challenge. With this diplomatic gesture, he was able to turn a perceived insult to his authority into a diplomatic victory, thereby establishing his control of the situation without embarrassing Hussey. Marley’s relationship with his band, the Wailers, was more than that of bandleader to hired musicians. They were like family, according bass player Aston “Family man” Barrett. Barrett’s success with Hippy Boys and the Upsetters band brought international experience and credibility to the Wailers. Fams, as he is affectionately known, said he enjoyed a relationship of mutual admiration and respect for Marley, based on each other’s talents and professionalism. While on tour, ‘Fams’ and Marley usually shared hotel suites. They would stay up late composing, writing, critiquing the night’s concert and exchanging ideas on Rastafari, music, religion and philosophy. “We often talked about the intrusion and influence of foreigners into reggae music,” Barrett said. Both agreed that continuing the commercial trend in reggae music was needed (much to the chagrin of some critics) until it had received sufficient international recognition, at which point they had planned to return the music to the Nyabingi form. Nyabingi is an orthodox form of Rasta, which focuses on celebration and reasoning. The return of the music to its Nyabingi origins would, they said, retain and maintain it’s cultural and spiritual integrity. Marley had other significant friendships. Producer Lee “Scratch” Perry, a 2003 Grammy winner was responsible for the Wailers’ most productive era during the early years of their career. Musically and philosophically the relationship was symbiotic. Songs like “Duppy Conqueror” and “Small Axe” exemplified their collaboration, highlighting the belief that the oppressed would ultimately triumph. Perry gave the lyrics of “Who Colt the Game” to Marley while he was standing next to a barb wire fence. Marley was captivated by the lyrics as he sang them. He failed to notice the barb wire as it tore into his foot. It was about 45 minutes before he realized that his foot was injured and bleeding. And so it was with Marley and Perry. Mutual accommodation was always the end result. The next day Marley went into the studio and recorded the song for Perry. These insights into the deeply personal side of this historic figure offer a glimpse into the private side of Marley. He was a man of great complexity, deep convictions and often stirred intense controversy for his radical belief that “every man has a right to decide his own destiny” and should “get up, stand up” for his rights, because “life is your right, so you can’t give up the fight.” He possessed an intelligent mind, was a brilliant musician and a thought-provoking lyricist. His ideas were compelling and his personality forceful. Though not formally educated, he was able to critically analyze and interpret the world in which he lived. His bias was decidedly toward the oppressed and poor, but his ideas had universal appeal. He was a man of great moral courage and spiritual strength.